Salmonella non-typhoidal is among the top foodborne bacteria that cause illness within the United States annually.With 1.4 million illness (11% of foodborne bacteria), 19,336 hospitalizations (35% of foodborne bacteria), and 378 deaths (28% of foodborne bacteria), Salmonella is estimated at costing the U.S. $2.65 billion in economic loss. 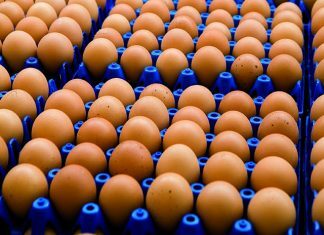 Within the poultry industry it is estimated that 47 billion shell eggs are produced annually with close to 2.3 million of these eggs Salmonella enteritidis positive. U.S. Department of Agriculture’s Animal and Plant Health Inspection Services, National Poultry Improvement Plan and Veterinary Services are the organizations that coordinate during outbreak scenarios with poultry and poultry products to ensure the safety of products produced within the U.S. Some serovars of Salmonella only cause infection in humans, others are host-adapted (meaning they may be only found in poultry or cattle) and while the three categories represents the largest group of Salmonella that are Unadapted and can survive within multiple host. The Unadapted category of Salmonella represents the majority of foodborne serovars, which includes enteritidis. Another key characteristic to Salmonella is the presence of over 40 different secreted virulence factors. Virulence factors are molecules that are excreted by bacteria so they can colonize and attach to the host, invade the host immune system, inhibit the host immune system response, allows for entry and exiting the internal cells and aids with obtaining nutrients from the host. With such a high number of these factors, Salmonella has a wide range of attack and survival mechanisms to affect poultry (broilers and layers). 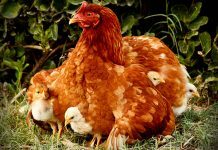 It is well researched that Salmonella’s primary method for transmission is through contaminated feed, water, the environment (air), and/or the mother to the offspring. Once Salmonella has entered the host, it passes through the stomach and colonizes the gut and adheres to the mucosa layer. Once colonization occurs, Salmonella has the ability to invade and infect other organs. Nesting material, dust, shipping containers, and rodents have also been linked to post laying contamination to the environment. Salmonella optimally grows between 37°C (5 and 45°C), at pH between 6.5-7.5, in moist conditions (Aw 0.93 or higher), with or without oxygen (facultative anaerobe). Salmonella has been shown to be more heat and acid resistant when the water activity and temperature are increased. 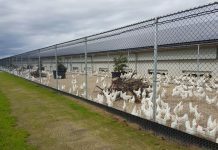 With the growing conditions of layers and broilers being high humidity, temperatures, ample oxygen, and neutral pHs in cage conditions, Salmonella is within their optimal growth conditions. With optimal Salmonella growing/survival conditions within the layer and boiler environment, creation of undesirable environmental conditions must be strategically planned. Reduction of critical elements within production along with practical measures to ensure that Salmonella is not brought into the facility from outside sources combined provides this strategic plan. Moisture levels, temperature control, and acidification of the environment are keys to this undesirable environment. Humidity and temperature control during the hotter and colder months can be controlled through ventilation system and location of facility to optimize the air-flow through the unit. Reduction of dust within the air is optimum for controlling Salmonella but significant increases in added moisture to manure can cause problematic for environmental Salmonella survivability. Acidification of water sources along with use of acidified sanitizers, have been proven to be effective at creating an undesirable condition for Salmonella. It must be noted that Salmonella can become acid adaptive so rotation of sanitizers is critical to reduce selection of specific strains of Salmonella. Flock health, sanitation, pest management, personnel, and incoming sources must be modified to prevent and control the presence of Salmonella. Flock health and selection of flock’s reliable sources for all phases of production is the first step to pathogen free environment. Reduction of stress levels is another method for creating an undesirable environment for Salmonella. Salmonella is an opportunistic bacteriua. It only causes problems in humans and animals having their immune system compromised and showing the opportunity to take over the host. When animals are stressed during production due to management practices (i.e. change in staff, change in environment, temperature or moisture changes, feed withdrawal) their immune systems are weakened and the ability of Salmonella to infect the animal is significantly increased (this has been shown in many different studies). Ensuring the chicken has a healthy immune system along with minimal stress, is ideal scenario even if Salmonella is present. Antibiotic treatments along with probiotics have been proven in several animal based studies to reduce the prevalence of infections with Salmonella when Salmonella is present. Nesting materials, dust, air sources, and feedstuffs are all controllable vectors to minimize the presence of Salmonella as they all are testable environmental samples to determine risk of contamination. Sanitization practices should include a cleaning and sanitizer step to reduce Salmonella within the environment. Cleaning is the removal of visual materials, which must be done prior to sanitizing or the killing of the bacteria. If the visual materials are not removed first then the sanitizing step is not effective. Rotation of sanitizers is critical to ensure that Salmonella strains are not selected for due to use of one category (not brand) of sanitizer. Another element that is critical to create an undesirable environment is to control the personnel flow and hygiene. Policies that limit the personnel’s ability to work on other farms, raise their own poultry, and take their vehicle to other farms should be written and enforced by management. Additionally, clothing and boot use and sanitation should be provided and understood policies on health conditions that would exclude them from work. 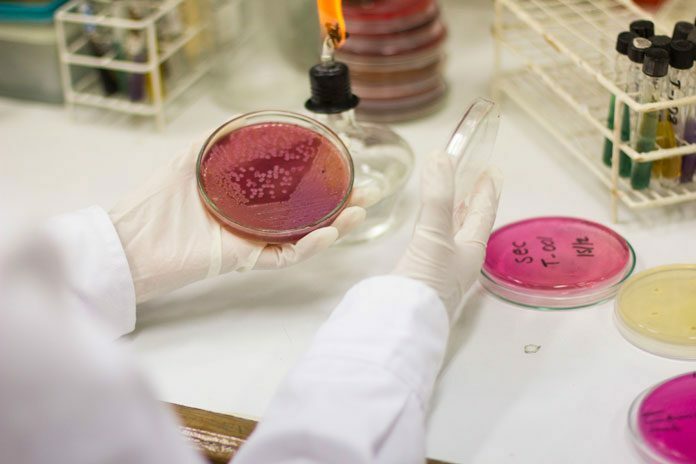 If a facility has a positive sample for Salmonella, it is critical to perform microbial swabbing in the areas, which should possess the highest populations if present. High-risk areas include air exchange fans, pathways from the exterior, personnel flow paths and rodent and birdpathways. Transmission of Salmonella through the air is seen by many experts as the primary method of exchange between the environment to the birds and from bird to bird. Capturing samples from the air inlets (inside and outside) will reveal if it is an internal problem or external contamination. Pathways from the exterior (outside the building) along with personnel flow paths will provide information about cross contamination, effectiveness of boot cleaners and policies modification that may need to occur with personnel flow. Rodents and birds are additional critical vector to transfer many different foodborne pathogens throughout a farm. Presence of rodents and birds increase the risk of Salmonella within the facilities and capturing of these critters may reveal Salmonella presence and the need for better pest management systems. Feed stuff and the flock are other key samples that can provide evidence of initial contaminations. Feed stuff and flock testing for Salmonella should be part of company policies for acceptable of shipments; therefore these two elements during an outbreak or positive Salmonella sample scenario would not relieve as much information about the environment. Salmonella characteristics assess that moisture levels, temperature control and acidification are key elements causing undesirable conditions. Teamed with healthy flocks, sanitation program, pest management, supply verification program and personnel policies will significantly reduce the risk of Salmonella. If Salmonella is detected, then focusing sampling on air exchange fans, pathways from the exterior, personnel flow paths and rodent and bird pathways will give the most information about the source of contamination.